As the title suggests, I have two quick questions. My other question which I hope someone could answer (because I can't find a logical explanation) is what was with the photos of all the people's reading glasses etc? I've seen some pics and it shows masses of them. What would they all have been collected for? Would they have been taken from the bodies before they were cremated? The pictures of reading glasses (and shoes, clothes, false teeth) or props displaying them are shown for pure psychological impact. Something like "look at that heap of glasses, all those people that have been gassed". The purpose is clearly to stimulate the imagination of the viewers. This got high persuasive value on the gullible, but zero probative value, because what does this actually prove? Nobody knows why those glasses and other trinkets did came for or why they were collected, one can only speculate. Such stuff is sometimes collected for recycling purposes, but does that in any way prove anyone was actually killed? Straight answer is no. In the Holocaust case it should make one even more suspicious. Because they are only showing those, because they don't have any hard evidence for their case. They function as some kind of relic to strengthen the faith of the believers. I guess it's no coincidence they've been put to use in a staunchly Catholic country like Poland. I was in Budapest in 1989 shortly after the Russian troops had left the city due to the Iron curtain coming down etc. On every major street corner in the city centre were large piles of uniforms and equipment which had been dumped, then collected by locals hoping to cash in. I bought an officer's peaked cap for a couple of quid. The point is, all those uniforms piled high by the thousand didn't mean the troops were dead, they just didn't need the stuff anymore so dropped it. Simple. The infectious and deadly disease of typhus was spreading through the body louse, so the Nazis removed every article of clothing a prisoner had on in order to protect the prisoner population from this disease this louse bore. The prisoner was then issued a new prison uniform, and the glasses and other articles of clothing were put somewhere else. The fact that we actually have their glasses, and the fact that the Nazis didn't just shoot them on the spot suggests that the Nazis had no intention of "systematically killing" all the Jews of Europe. It's my understanding that the yellow stars were indeed a Jew idea. As for the glasses & shoes, those are pure stagecraft. IF the Germans had done what is alleged, then why would they leave behind items which would be incriminating? They wouldn't. 'IF the Germans had done what is alleged, then why did they allow thousands of Jews to stay behind at Auschwitz so that these Jews could then tell everybody about the alleged events? If there was ‘a plan to kill every Jew the Germans could get their hands on’ as alleged, then why are there countless numbers of so called “survivors"? Clearly, from 1944 until January 1945 more people would have died and presumably many of the deceased wore spectacles. The shoes mean nothing other than the inmates' shoes were replaced with wooden clogs. "As a rule guards stripped the prisoners’ of their footwear when they arrived at the camp and gave them wooden clogs instead. " The myth makers rely on the old adage : "a picture paints a thousand words", the power of suggestion, the reader's gullibility, ignorance and their willingness to "believe" that these artefacts somehow allude to alleged mass murder. To prove accusations of murder, it is customary to invoke habeus corpus, literally "that you have the body". But, like many other aspects of the Holocaust narrative, this legal principal was dispensed with, so that, to this day, nobody knows where the alleged bodies are. Piles of shoes and glasses are poor stagecraft substitutes for evidence of mass murder. 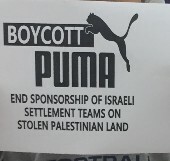 What say you The Goy ? The piles as stagecraft, may have had their inspiration, their roots, in recycling. Germany is and was the premiere recycler in the world. Belsen did something with shoe soles I remember reading in Ben Shephard's book After Daybreak. Hair was saved during the war and contains a protein called L-cysteine which can be extracted and is done so in some countries to this day. Psych Warfare likes to build lies via a twist on real things. On an abstract level, it's taking German traits and twisting it to horror. For instance German "industriousness" has been taken and turned into "industriousness" in processes to kill Jews. When that is portrayed in movies, the accent and the mannerisms are all taken to be associated with killing Jews. 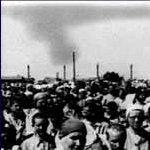 Such as the "expert" in Year In Treblinka saying "tadelos" or "perfect" for the killing system. The guy whose face melts off in the first Indiana Jones and the Temple of Doom movie, who looks supposedly very German complete with monocle (an English actor actually) would be the sort of thing I'm talking about. The kids watching it, unaware of the absurdity of focusing on a Jewish treasure (ark of the covenant) which is fictitious, in the land of Egypt, which is full of real ancient Egyptian treasures. LOL. 'we don't need evidence, we have witnesses'. The piles of glasses, hair, shoes etc are all used as though they are witnesses to the fact. They are not. Incidentally if someone can attribute that quote -we don't need evidence, we have witnesses - it would act as a great tag line for one of our newer friends for his sign off. In some ways that quote really does encapsulate all that fails in the claims of the holocaust. To think that one can claim six million people murdered, on a scale and in a system never before seen in the history of the world and expect everyone to believe it just because some people think they may have heard about it happening somewhere, is preposterous. At the trial of Adolph Eichman one witness brought a pair of shoes into the witness box and plonked them down as evidence. There is an undeniable and deep-seated emotional link to "orphaned" items of personal property.and it would be surprising if psychologists had not recommended their use in reinforcing the narrative. Think of Rosebud in Citizen Kane. The glasses are what trouble me. The mountains of hair have a simple explanation - prevent typhus. Obviously the National Socialists cared about prisoner healthcare, as Mattogno goes into detail at length in "Healthcare at Auschwitz", so why would they dispose of all the eyeglasses? Many people, including myself, need them in everyday life - wouldn't this hinder the working ability of the prisoners who needed their eyeglasses to see properly? It doesn't add up. DissentingOpinions wrote: The glasses are what trouble me. The mountains of hair have a simple explanation - prevent typhus. Obviously the National Socialists cared about prisoner healthcare, as Mattogno goes into detail at length in "Healthcare at Auschwitz", so why would they dispose of all the eyeglasses? Many people, including myself, need them in everyday life - wouldn't this hinder the working ability of the prisoners who needed their eyeglasses to see properly? It doesn't add up. - How many sets of eyeglasses are there? - How many people died of disease & natural causes at Auschwitz? How many of them wore glasses? Stanisław Mucha took this photograph after the Soviet Army liberated Auschwitz-Birkenau. 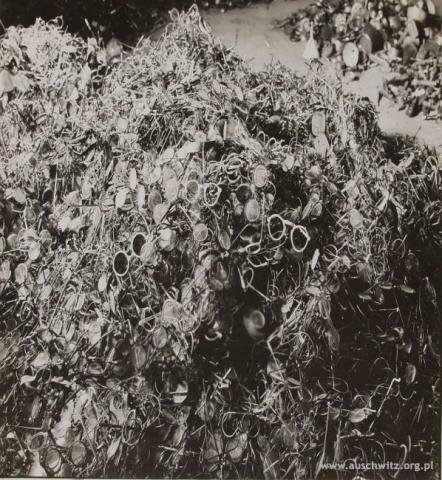 It depicts piles of eyeglasses which once belonged to people who were subject to mass extermination at the Nazi death camp. They didn't always take existing situations and lie about them. Sometimes the Soviets, British or the Americans falsified evidence. The eyeglass pile could be that. The Americans via Psych Warfare went as far as to say the gold fillings from Auschwitz were kept in the same place as Germany's gold reserves in the Merkers mine. Imagine all the gold in Fort Knox, USA, and then with that gold, some gold fillings. It's absurd. There's a chance all those glasses are not made from 100's of different makers all over Europe, with many different prescriptions. Carto's Cutlass Supreme wrote: ....They didn't always take existing situations and lie about them. Sometimes the Soviets, British or the Americans falsified evidence. The eyeglass pile could be that. The Americans via Psych Warfare went as far as to say the gold fillings from Auschwitz were kept in the same place as Germany's gold reserves in the Merkers mine. Imagine all the gold in Fort Knox, USA, and then with that gold, some gold fillings. It's absurd. Conveniently it's a Black and White photo. But is it even jewelry? Some of them look rather like curtain rings from the hardware store or parts for pluming, mixed in with what is possibly real jewelry rings. I should add that governments have the habit of claiming anything where the owner can't be contacted. In case of war, it's plausible that an army pulls anything out that is somehow valuable. Confiscation is also possible, but has to be compensated at least by a receipt that has to be balanced at a later stage. 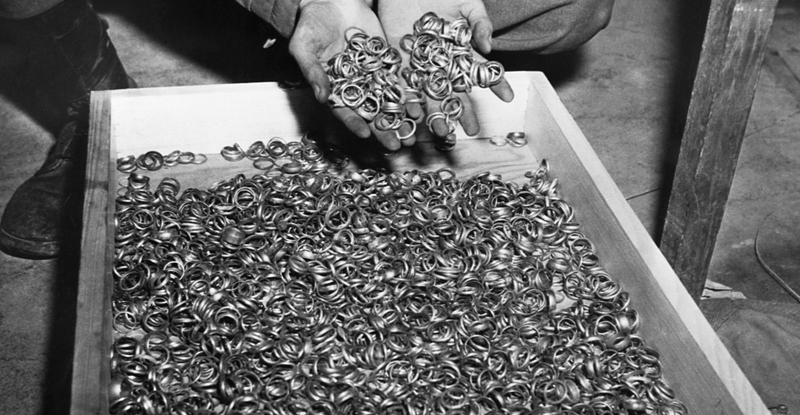 So the Germans were so desperate for gold that they supposedly seized wedding bands of 'gassed jews' and left them behind so that they would be incriminated rather than melting them down into usable bullion. "Eyewitness", Romanian Jew Sigismund Bendel, actually said that the Germans had extracted seventeen tons (34,000 lbs.) of gold from victims teeth. "It depended on the state of their teeth or their dentures." and the bags fetched out and filmed.